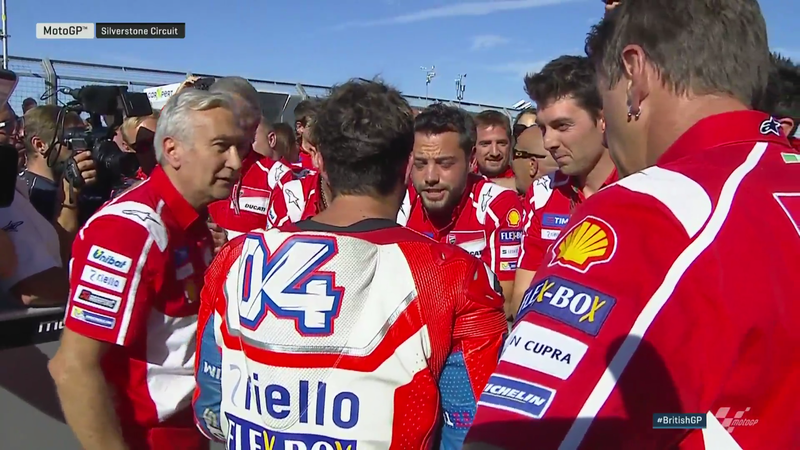 Andrea Dovizioso (Ducati Team) became the first man to win four races this season, as the Championship challenger put on a tactical masterclass once again. In a close second but unable to make a last lap lunge was Maverick Viñales (Movistar Yamaha MotoGP), with early leader Valentino Rossi (Movistar Yamaha MotoGP) completing the podium. As well as the podium finishers, the standings took a shake up as Marc Marquez (Repsol Honda Team) was forced to retire. 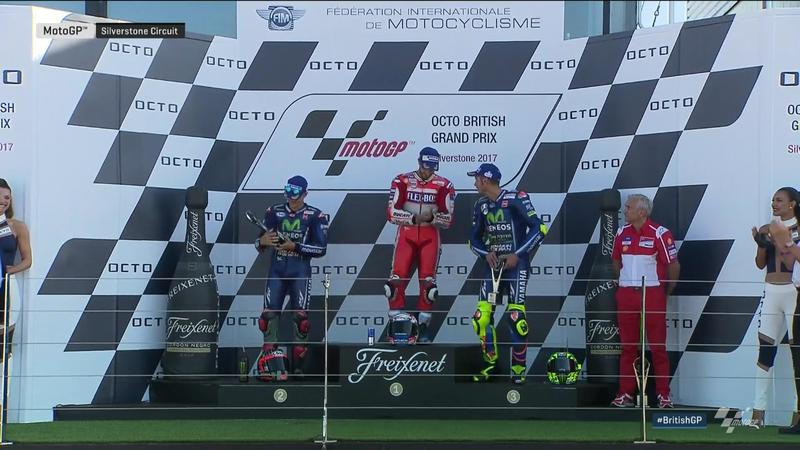 Lorenzo had a great race to cross the line in fifth – and only 3.5 seconds off the race winning time of his teammate. The ‘Spartan’ overcame Johann Zarco (Monster Yamaha Tech 3) in the latter stages to pull a sizeable gap on the Frenchman over the line as he continues to move forward. Zarco took P6, comfortably ahead of a more difficult day at the office for Dani Pedrosa (Repsol Honda Team). Marc Marquez’s (Repsol Honda Team) hopes for victory at Silverstone went up in smoke with seven laps to go, as the number 93 was forced out of the fight at the front with a mechanical issue. The loss of prospective points blows the title fight wide open, with eventual winner Andrea Dovizioso (Ducati Team) able to move back into the Championship lead in the aftermath. All is far from lost, however, as Marquez remains second in the standings and had good pace at yet another venue. Now nine off the lead and four in front of third-placed man in the standings Maverick Viñales (Movistar Yamaha MotoGP), it’s still very much game on. 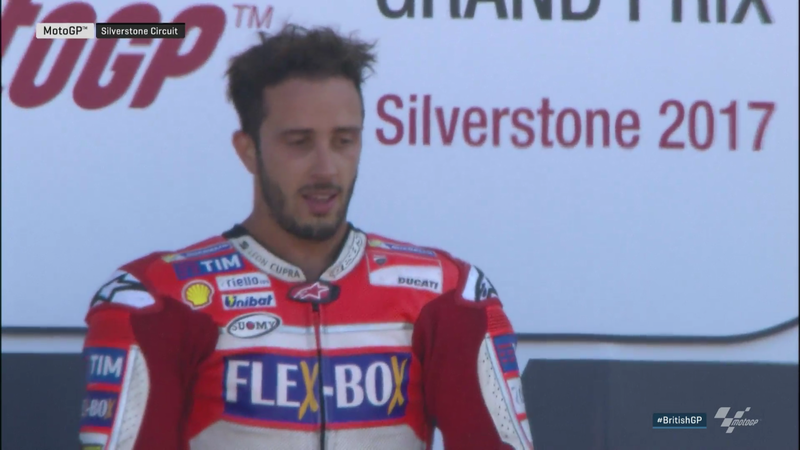 Andrea Dovizioso (Ducati Team) took win number four at the British GP, taking back the Championship lead from Marc Marquez (Repsol Honda Team) and now nine points clear at the top. 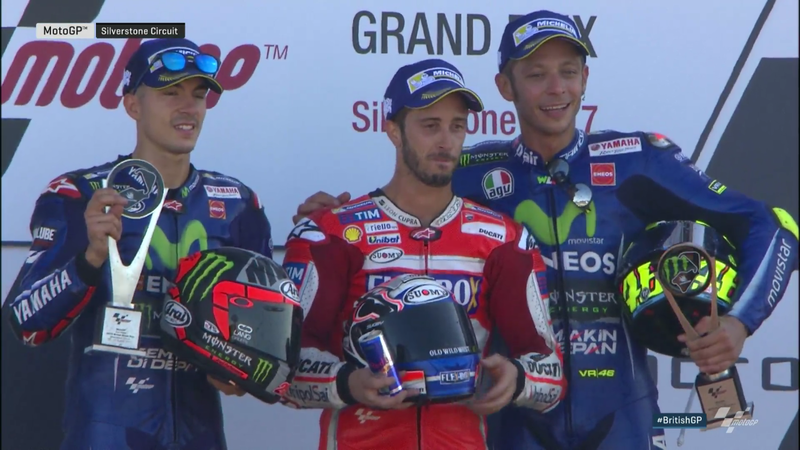 Staying in contention throughout and then perfectly choosing his moment to strike, ‘DesmoDovi’ pushed to the maximum on the final lap, just able to stay out the clutches of Maverick Viñales (Movistar Yamaha MotoGP) – by a tenth. Cal Crutchlow (LCR Honda) converted a front row start into a top four finish at his home British GP, and the rider from Coventry was top Independent Team rider to boot. But after getting on the podium last season and feeling good throughout the 2017 weekend, the two-time GP winner is a little frustrated to not have been able to fight for the win. 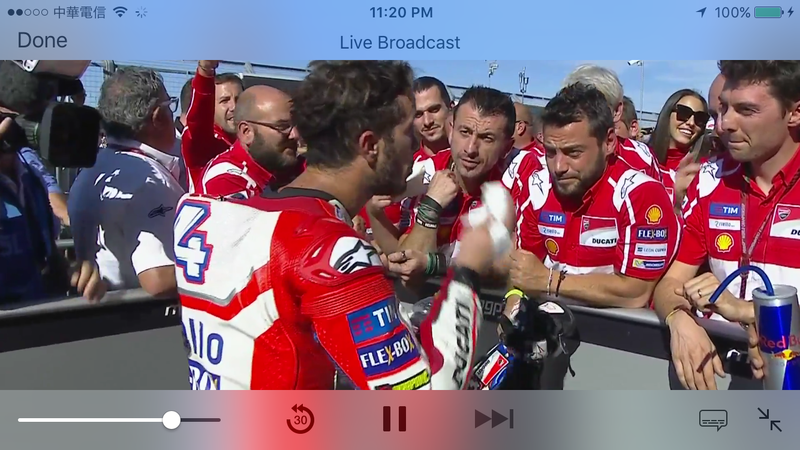 That said, he says he did the best he could – and heads for Misano with his head held high. Cal Crutchlow, P4: “It’s frustrating as I came here to win. You try to win every weekend, but this weekend was a special one, I felt good last year and I felt good again all weekend here, but I just didn’t have enough in the end. The other guys were quicker than me today, the front tyre was too soft for me as always and this was the reason I was struggling with the rear tyre in the end as I was having to spin a lot to turn the bike. Valentino Rossi (Movistar Yamaha MotoGP) shot off the front row and into the lead of the British GP, holding the advantage for most of the race until Andrea Dovizioso (Ducati Team) and Maverick Viñales (Movistar Yamaha MotoGP) were able to reel him in and get past. The rider from Tavullia gave everything to hit back, just not quite able to do it – but he did fulfill his Saturday prediction by completing the podium in third. Happy enough with that, Rossi is even happier about the marked improvement made at a Misano test day and carried into the British GP weekend. Valentino Rossi, P3: “I’m happy because for me it was a very good race after a good weekend, I made a good start and was able to ride well and give the maximum all race. This weekend we’ve improved and understood something important. In Misano in the test, we worked on the electronics on acceleration to try and save the tyre, nothing big but it worked here. I had good pace and could stay in front and ride the bike in a good way. We were worried because we suffer a bit in the last laps, but with five to go I thought I could do it. But I suffered a bit too much and Dovi and Maverick overtook me. It was a bit frustrating because I wasn’t strong enough to fight to re-overtake them. I tried everything and two or three times I went into corners and didn’t know if I could stop! But I’m happy because the podium was my target and we all arrived close together. To ride Silverstone on a MotoGP bike with this weather is really fun. It’s a great way to have my 300th race, in front a lot and fighting for the victory – that’s the goal, to continue as long as I can fight with the top guys.